As the 1972 season entered its last week, Pittsburgh’s 38-year-old right fielder, Roberto Clemente, was tired. Coming off an MVP performance the year before in the Pirates’ World Series victory over Baltimore, Clemente had labored through arguably the most difficult of his 18 seasons with the Bucs. He had been bothered by a serious intestinal virus for most of the first four months of the season, and suffered from strained tendons on both of his heels. From July 9 to August 22, “Arriba,” as longtime Pirates broadcaster Bob Prince liked to call Clemente, started just one game. By August 25 Clemente’s averaged had dipped to .301 and he had managed only 82 hits; collecting 36 more in the final five weeks to reach the magical 3,000-hit plateau seemed like a long shot. Despite the injuries and age, Clemente had lost none of the drive that made him one of the best players the game had ever seen. “No other player surpasses Clemente in all out strain and effort,” wrote Gary Mihoces of the Associated Press. 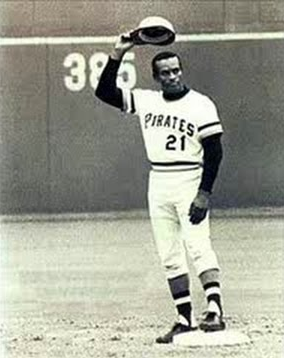 “He runs out every infield grounder as if the World Series were at stake.”1 A four-time NL batting champ en route to his 12th consecutive Gold Glove Award in 1972, Clemente was as easily recognizable for his unique mannerisms, such as rocking his head back and forth trying to get the kinks out while preparing to bat, and his basket catches, as he was for his rocket arm, which earned him the reputation as one the best right fielders in history. But Clemente was more than baseball; he was a proud individual and Puerto Rican. He refused to accept the Americanized name, Bob, that the press had tried for years to heave upon him. And he fought tirelessly on behalf of his fellow Latino ballplayers and demanded that they be treated with the same respect afforded to Caucasian ones. A sparse crowd of 13,117 was on hand in Three Rivers Stadium for the 2:15 start time to catch a glimpse of history. On the mound for the Pirates was the 27-year-old enigmatic right-hander Dock Ellis (14-7, 2.80 ERA), hoping that an effective outing might earn him a start in the playoffs. After winning a team-high 19 games the previous season, Ellis had been bothered by tendinitis in his right elbow most of ’72 and had not started since tossing 6? scoreless innings against Chicago on September 12. Toeing the rubber for the Mets was eventual ’72 National League Rookie of the Year southpaw Jon Matlack (14-9, 2.31). After Ellis tossed a scoreless first, Pirates fans got to their feet when Clemente came to bat with two outs in the first. Standing well off the plate, the noted bad-ball hitter struck out swinging, sending the crowd into a collective sigh. 1 Gary Mihoces (AP), “Roberto Clemente Reaches Baseball Exclusive Ranks,” Danville (Virginia) Register, October 1, 1972: 6D. 2 Al Abrams, “Was Robbed of No. 3000, Roberto Says,” Pittsburgh Post-Gazette, September 30, 1972: 1. 4 Bob Smizik, “Roberto Gets 3,000th. Will Rest Till Playoffs,” Pittsburgh Press, October 1, 1972: D1. 5 “Clemente Notches 3,000 Officially,” New York Times, October 1, 1972: 31. 6 KDKA game broadcast from September 29, 1972. Clip available on YouTube at http://youtube.com/watch?v=XsmqqPxb_xM. 12 Charley Feeney, “For Clemente After 3,000, Saturday Cheers Linger,” Pittsburgh Post-Gazette, October 2, 1972: 24.